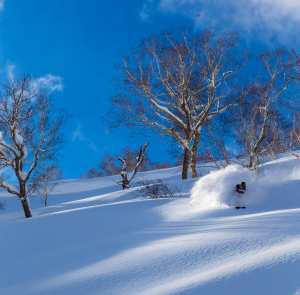 You don’t need skins and alpine tour bindings to get amongst the backcountry gum trees of Australia as some of the best runs are accessible from resort lifts. 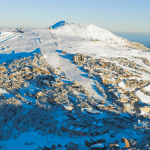 Thredbo’s Dead Horse Gap is accessible from the top of Karel’s T-Bar and if you’re prepared to do a minor hike and negotiate a number of trees while staying high, you won’t end up in the creek. I was promised beer and bangers at the end of my first trek to Dead Horse Gap, and with a hangover from apres hell they were more than what the doc had ordered. 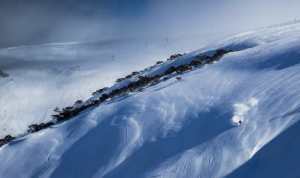 A blue sky day provided the ideal backdrop and a motley crew met up at midday to take on the Aussie alpine outback. 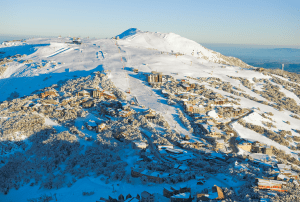 Like most alpine towns Thredbo has at it’s core a community of locals who love ‘their mountain’. They are generous of soul, passionate about alpine life and thrilled to show any newbies what they’ve been missing. But be warned locals can tell a fraud at ten paces, they’ve been around long enough, seen enough and heard enough to size you up with one simple sniff. Try hards need not apply. 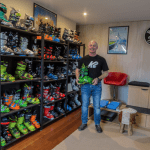 Tony Tressider has worked in the snow fields for decades at the helm of various food outlets of Perisher and now with his business and life partner, Lena who founded Snowsport , a swanky outerwear and fashion store in the village square and the home of SOS and POC helmets. 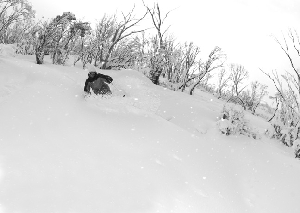 He’s charismatic with a belly laugh that would shake the snow off any tree and he loves to show off his favourite part of Thredbo – the backcountry. He’s brought along farmer Sam, a wise cracking bloke with a heart of gold and a quick wit, a couple of mates from out of town (ragamuffins I have seen holding up various bars after midnight), gourmand party gal Julie from the Alpine Way and Adie, a leggy blonde from Sydney who bites chunks out of life. I know that the rule of backcountry is you carry your own skis, you don’t complain and you go at your own pace but when I’m twenty minutes late and there’s a crew already on a snowy knoll on the distance clearly tapping their feet and waiting for my wheezing self to get there those rules go out the window. When farmer Sam offers to haul my skis up the boot pack hill I don’t say no. The snow was variable, firm up top till we made it to the tree line where it was more creamy than crusty. Navigating the maze of gum trees we skied through a mix of firm, cream then crud then cream again but we’re not out here just for the snow. We’re out here to share a blue sky experience, a mix of first timers and regulars, it’s a lot of schlepping just to get a sausage. Dead Horse Gap is not a difficult run, it’s fun and cruisey and a great opportunity to get amongst it outdoors. Banter is premium with lots of laughter and giggles and some typical Aussie ribbing. The best turns of the day were the four we made from the clearing of trees down to the flowing creek where we stepped out of our bindings and drank fresh flowing water straight from the stream. Some thoughtful folk had driven ahead earlier in the day and set up a bbq in the snow. We cranked it up, cracked open the beers while Tony turned sausages on the bbq with a makeshift pair of tongs made from twigs. There’s something about a processed supermarket sausage slapped into a piece of white bread and slathered in tomato sauce that just screams Australia. Word, or the aroma, must have got out as soon other locals arrived by car to share the wares. I’ve skied bigger mountains, steeper pitch, better powder but to date this is one of the best days I have had in the snow anywhere in the world. There’s something about combining Australia’s favourite barbie under snow gums after a minor workout through the Aussie alpine bush with great characters that just keeps the lips grinning.